I cannot stay away from you. I really really need you now more than ever. You see, its the bond that we have for more than 20 years. How can you forget that? Okay, so it was me who moved away from you since I had to start a new phase in my life but then again its your fault that you entice me into your captivity all the time. I cannot help myself. Be it the drive at Worli Sea Link, the catamaran ride near The Gateway of India, the evening frenzy at Juhu beach and the Chowpatty mania, the lush green view at Chhota Kashmir or the escapade at Essel World, I can always seem to recall all those beautiful moments with you. I still vividly reminisce the deliciously tempting Sardar Pav Bhaji, crisp goldenVada Pav, tasty Zunkha Bhakar, tangy Paanipuri, yummy Bhelpuri, or Bandra's Jays Sandwich that I so relished. The countless cutting chais, juice at Haji Ali Juice centre, Keema Pav at Stadium's, Martin's Goan fish curry or steaming Momos- I cannot tell which was most appetizing. Damn! Why does being away from you drag me back in a BEST bus or Local Train ride to the nearest station. So what if you've changed your name?... I still see people calling with both your old and new names. Who can forget the time you suffered on 1993 blasts, the twin train blasts, 26/11 attack and 26/7 floods? I cannot. You were hurt and so was I. But, you came back strong alive and still kicking. All thanks to prayers sought at Siddhivinayak, Mahalakshmi, Haji Ali, Parsi Agiary and Mount Mary Church. 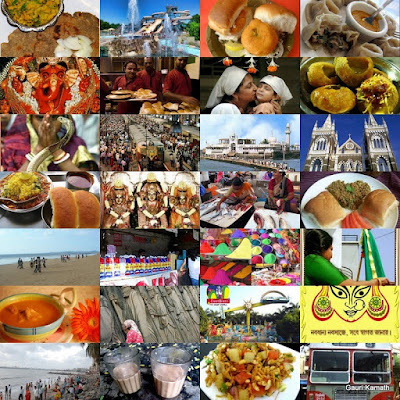 Year after year we rejoiced and celebrated Ganesh Chaturthi, colorful Holi, holy Durga Puja, joyous Mount Mary Bandra Fair, Koli Mahotsav, Nag Panchami, Gudi Padva, Id, Pateti, Onam and the splendour of Kala Ghoda Art Festival. That doesn't mean that I adore the frequent water-cuts, roads in potholes, hawkers on foothpaths and flyovers that you have created. I still haven't come in terms to them. Yet it is because of you that the Tatas, the Ambanis, the Jindals, the Mangeshkars are grateful and many those who aspire to become like them some day, come to you. Be it Marine Drive, Film City or the Bandstand you have avid followers. The Khans, the Bachchans or the rest of the Bollywood are forever indebted to you and are nothing but mush without your spotlight. I know it is not fair to love you too much. Like a million other people you have stolen my heart too. But I'm adamant, my love affair with you will continue. YAY!! Way to go Gkam!! You got it right, Mumbai rocks!! And only those who have lived here long enough will know the value of those places you have mentioned above in bold. ;) You rarely find these in any other city. yeah we can really say goodbye to the spirit of Mumbai which always is the real synonym of a fighter..to keep moving ..
Have been to Mumbai but for a very short visit.After reading this post, I really want to visit all these places that you've mentioned! A very different take on 'goodbye'. Liked it! so ur a pakka bombayite too? Even when I shifted from Mumbai to Pune some 8 years ago I couldn;t bring myself to say a decent goodbye to my mother city! I can NEVER say Goodbye"
Most creative! Like the way you've applied the topic to a place rather the more obvious person. All the best! I read, re-read and re-re-read your post, visited most (if not all) of the places mentioned, tasted the tang of pani-puri, imagined the peace I find in my chosen Agiary, and felt the calm of Mount Mary at 2:25 AM. I realized that where-ever life may take me, I will eventually find my way back home, to Mumbai aka Bombay! Also, I loved the twist that you have taken on the theme! never been to mumbai so don't know howz it? but u used the theme altogether in a unique way..
and the post is awesome and yes i can completely agree to the fact that u can never truly say goodbye.. Yes, I wonder if any other city and its people who has been affected by Bomb blasts one day has so much resilience to get up to the routine grind from the very next day. I wish you could come to Mumbai and experience it for yourself. Hope on your next visit you get to experience more of Mumbai's magic! I'm so glad u thoroughly enjoyed it! Tell me about it. I agree! Yes there might be a never-ending list. In my defence, I love some aspects of Navi Mumbai yaar. and i know how u feel. But, I guess I need more years to understand NM. And warm welcome to my Blog! I'm glad u found my post refreshing. I love you_ Aamchi Mumbai!! Beautiful post! I loved the whole experience. Mumbai has been my fav. city and each and every thing that you have mentioned made me to go back to Mumbai and feel again all my childhood memories..! Memories with Mumbai! very different take on Goodbye... interesting read. a lovely tribute to the grand old lady - bombay! 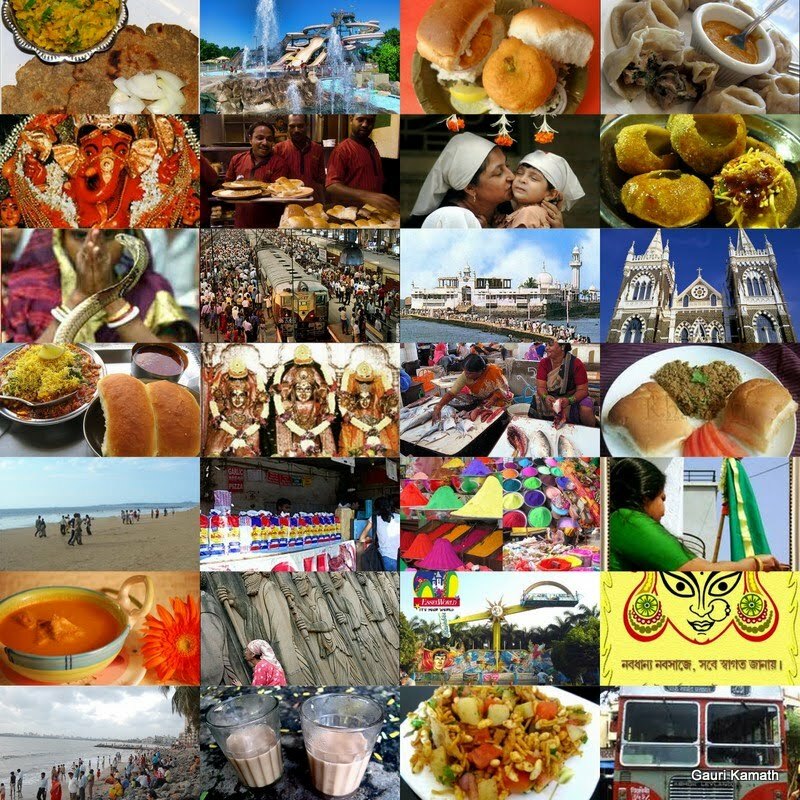 Bombay/mumbai - different take and you've done it by bringing forth the prominent flavors of the city - kudos for that. It's my very first time reading your blog. I think I'll come back for more. I'm not from Mumbai, still I liked your post. The post shows your love for your city. can relate to it.I love this city,and there is no way I would ever want to leave it. love your take on the topic. you definitely get attached to the place you have had so many experiences. Love for the city is a strong one. I can relate to you but mine is Bangalore. Very well put across, good one! you depicted a very beautiful and colorful city rich in traditions n culture! Ah don't all of us feel the same way about our cities? The place where we were born and brought up...we can never say goodbye. mumbai!!!!.. i must agree its a magical city...anything can happen here...and well the food....i go to mumbai from pune on the weekends just for food!!! Hey Good one... I have generally observed one thing. Majority of those who have lived in Mumbai for long,especially those who are born and brought up there, have a very strong liking for the city, almost to the point of obsession. I have not seen so much passion for other cities. Must be something about the city of Mumbai. i accept every one thing and more..
And yes your post mad me hungry, the 2nd para dealing with the mouth-watering delicacies! :) Looking forward to meeting the Mumbai you so love..
i am not a mumbai-ite but yes I love my city too... so everything that u said about Mumbai, made sense to me... very very well written... although am not from Mumbai, the whole article got a huge smile on my face... all the best for BAT! Truly amazing post! you gave a completely different meaning to Goodbye! Unique! I have worked in Mumbai for 6 long years and stayed in Navi Mumbai for 11 years :) and I second your thoughts about Mumbai! Once a mumbaikar - always a mubaikar! Quite a refreshing take on the topic.Very well done. Having been a Mumbaikar myself before,it just took me down memory lane. wuu huu, finally found someone who shares my passion of mumbai!!! Simply wow!! :)) It took me down the memory lane... Thank you! All the places, the vada pavs and bhel, BEST and local trains... Mumbai is so multi-faceted and this post has touched the city's soul!! All the best for BAT-13. Cheers! I love this post! I have memories shared with Mumbai. The most painful moments of my life have been shared with this city. Mumbai fostered me in my deepest agonizing moments. Perhaps, that is why I love Mumbai! Where there is pain, there is a love hidden somewhere. I'm glad to know that my post made some of you salivate and took some of you nostalgic. Do keep visiting my blog..